While it’s probably obvious, online activities have replaced a very large chunk of the time we used to spend watching the tube. Sure we surf for information across all formats, text, audio and video, but video is becoming the most popular form of content on the web. YouTube is now the third most visited site on the internet behind Google and Facebook according to Alexa Traffic Rankings. More than 24 hours of video is uploaded to YouTube every minute of every day and when you consider that most videos are under 5 minutes in length, that’s a heck of a lot of videos. There are other video platforms as well, such as Vimeo, digg and others popping up to increase the volume of video content even more. Keep it simple! No need to be Steven Spielberg behind the camera and no need for a degree from MIT to use the technology. You can buy decent camera’s that shoot HD Video or even use your smartphone to get decent video footage. Content is much more important than having a super high quality video so focus your efforts on what you are going to put on the video instead of all the bells and whistles. If you want to fancy it up with some graphics, texts and effects, you can buy a basic video editing software package like Sony Vegas Movie Studio. You can learn the program in about an hour. If you want to use a really cool template, go to VideoHive and check out some of the templates there. With some of the VideoHive templates, you can simply add photos and text to come up with something terrific. If you find it a bit too technologically challenging, you can hire a video editor through Elance or Fiverr pretty reasonably. Define your purpose. As we’ve discussed, video can be a powerful tool for marketing your listings. As a guide, think of how you typically use still photography in your marketing efforts. Virtually anything that you would usually shoot with a camera can be enhanced by shooting it with video. In addition, you can narrate what the viewer is seeing as you shoot by simply speaking while you are shooting. Be sure to plan this out and know what you are planning to say about what the viewer is seeing. Video also gives you the opportunity to widen the horizon of what the viewer sees by including surrounding properties, amenities, traffic, etc.Video can also be a fantastic tool for building your brand as a commercial real estate professional. Why not shoot a short video highlighting all of the properties you have sold or leased? Or video testimonials from satisfied clients? Or create a video resume, all of which can be used in your business development efforts when presenting yourself to potential new clients. Make it short and high impact. Attention spans just ain’t what they used to be so make sure your video is under 5 minutes, preferably under 3 minutes. Identify the video content you intend to produce and eliminate everything but the features of highest impact. Shots of commercial real estate properties only need to be seen on the screen for a few seconds before moving on. Remember you want to leave the viewer wanting more so leave something to the imagination. Be the face and voice of your video content. When clients make a decision to have a commercial real estate broker or agent represent them, the primary factor in their decision is YOU. They are buying YOU, more than your company, your marketing materials, etc. So when you produce video to use in your commercial real estate business, make sure the viewer experiences the person behind the content. If you are afraid to be on camera when representing your listings or your brand, you’re probably in the wrong business. Video can be a huge brand builder. Have a structured plan for maximum exposure. Every commercial real estate professional should have a well thought out and written marketing plan. When factoring video into that plan, identify the most effective way to expose your videos to the audience you want to reach. This includes posting it to your website (if you have one), on YouTube, Vimeo or other sources, within your blog if you have one, etc. Also make sure your video is in a format and of a size that can be easily delivered via email. 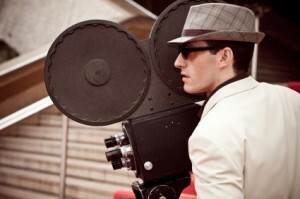 If you choose to take on the expense, your videos can be burned to DVD for distribution to your clients and prospects. You can do this with most computers that have a DVD burner or for mass quantities you can utilize a service such as Corporate Disk (www.disk.com). The bottom line is that commercial real estate pros have an opportunity to set themselves apart by using video in their marketing and branding efforts. So what are you waiting for? Go get the Flip cam and start shooting! This entry was posted on Sunday, February 10th, 2013 at 8:50 pm	and is filed under Branding, Business Development, Client Communications, Commercial Real Estate Industry, General Information, Marketing, Presentation Skills. You can follow any responses to this entry through the RSS 2.0 feed. You can leave a response, or trackback from your own site.